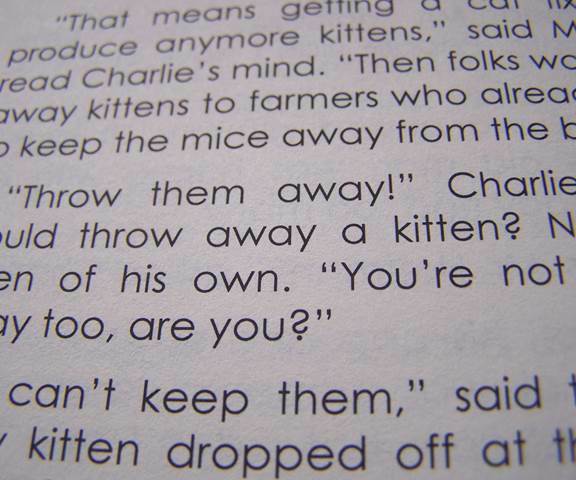 We’ve had several readers provide feedback on font selection for children novels. It seems many standard fonts are difficult for children to read because of two letters that appear foreign to their inexperienced, young eyes. Those letters are lower case A and G.
Taking this in to consideration, we decided to publish Throw Away Kitten by Candy McMudd in a font that reflects the natural writing format. We experimented with several and chose Century Gothic. Here’s what the text looks like. The print version of Throw Away Kitten will be available shortly. The eBook version is available at Smashwords.